Tested to BS 476 Part 22:1987 at the Loss Prevention Laboratory. Galvanised or Polyester Powder Coated Finishes Available. Fire Alarm Interface: when linked to a suitable fire alarm system, the roller shutter will descend at a controlled speed on activation of the fire alarm. 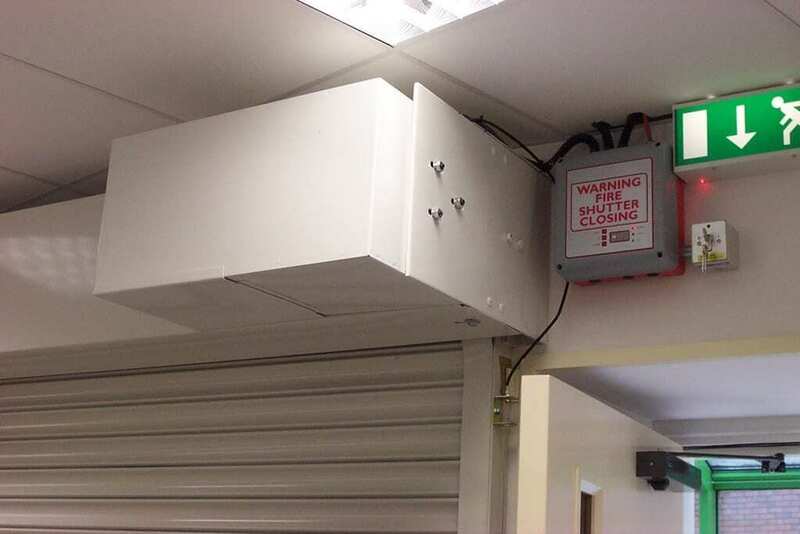 Fire Control Panel, with optional Audio/Visual & Battery Back-Up System which can be programmed to work in a number of ways, when linked to a suitable fire alarm system, the roller shutter will descend at a controlled speed on activation of the fire alarm. SUITABLE FOR All types of non-residential properties including: Schools, Shops, Factories, Garages, Retail Properties, Hospitals, Canteens and Catering Facilities, Warehouses etc. Sizes available: Up to 6.0mtrs Wide x 5.0mtrs High – Larger sizes may be possible depending on application. The curtain is built using traditional cold rolled formed steel galvanised laths. The curtain is laterally secured using steel endcaps. ‘T’ profile bottom rail fitted to the base of the roller shutter curtain.